On a cool summer’s night, one can hear the wolves howling in the distance. For some, this sound strikes fear into their hearts as it conjures up dark and frightening images of fearsome creatures on the hunt for their prey. However to those who understand and respect the beauty and majesty of the wolf pack, it evokes something different altogether.It has been said that when wolves howl at the moon together, it represents their primal instincts and their undying loyalty to the pack. A unity where their beliefs, goals, and sense of purpose are all intertwined. The three howling wolves on the Alphabet Vodka logo represent our wolf pack. Three brothers showing our love and loyalty to our father who we lost a few years ago. Our father has always been a driving force in our lives. He is the inspiration and motivation behind making and sharing memorable moments. He believed in celebrating life and making time for those who made it special. As a tribute to everyone who has ever believed in celebrating all of life’s special moments, we bring you Alphabet Vodka. 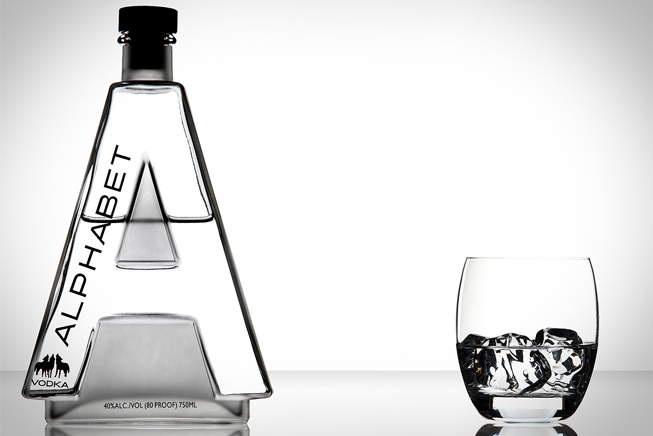 Our patent pending designs and exceptional tasting vodka offer the experience of a lifetime in the world's first personalized vodka. We invite you to celebrate your special moments with us, and with Alphabet Vodka, and share in the beauty of living in the moment!